This comprehensive cat care guide from the star of the hit Animal Planet show "My Cat from Hell," Jackson Galaxy, shows us how to eliminate feline behavioral problems by understanding cats' instinctive behavior. Cat Mojo is the confidence that cats exhibit when they are at ease in their environment and in touch with their natural instincts--to hunt, catch, kill, eat, groom, and sleep. Problems such as litter box avoidance and aggression arise when cats lack this confidence. 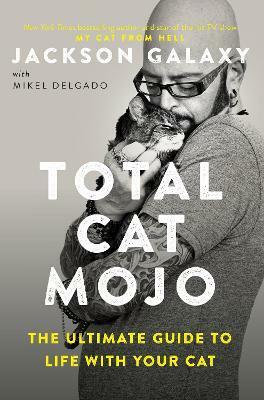 Jackson Galaxy's number one piece of advice to his clients is to help their cats harness their mojo. Jackson Galaxy is a cat behaviorist and the host of Animal Planet's hit show My Cat from Hell. He is the coauthor of the New York Times bestseller Catification: Designing a Happy and Stylish Home for Your Cat (and You!). Jackson is also the author of Cat Daddy: What the World's Most Incorrigible Cat Taught Me About Life, Love, and Coming Clean. Mikel Maria Delgado is co-owner of Feline Minds, a San Francisco Bay area based cat behavior consulting business. She is currently working on her doctorate in psychology at the University of California at Berkeley, studing animal behavior and human-animal relationships.